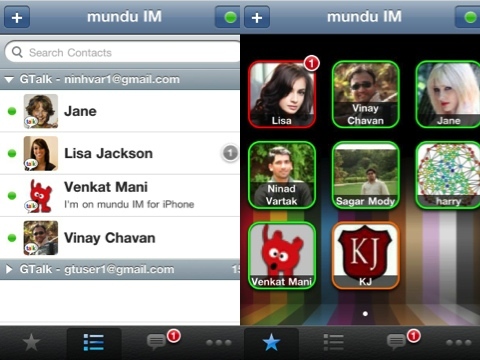 Unlike most other instant messaging clients which give you the look, feel and experience of a desktop application , Mundu IM Pro has been designed keeping in mind the iphone user. – Intuitive and highly usable User Interface. – Connect to multiple accounts and services at the same time. – Archive all your conversations, so that you can refer to them at any time. Also you can e-mail chat conversations directly from the application. – Manage all your important contacts using the favorites screen. – Switch between multiple conversations easily using the active chats screen. – Set custom time-out period. Select how long you want to remain online while the app is running in the background. -View contact’s profile picture and also set your own profile picture form within the application. – Search Contact/Chat History in one place by using the search bar. AppSafari review of mundu IM Pro was written by Joe Seifi on August 6th, 2007 and categorized under App Store, Chat, Utilities. Page viewed 5026 times, 1 so far today. Need help on using these apps? Please read the Help Page.